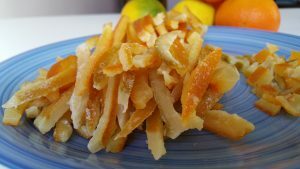 Candied Peel is used in so many Christmas Recipes – Why not make your own?Its super easy to make so here I’ll show you how to make some. Remove the peel from the fruit. You can check out my video here to see a cool way to peel the fruit. Slice the peel into long strips. Fill a pan with water and bring to the boil, then add the peel and gently boil for 5 minutes. Pour into a colander to allow the peel to drain. Take the saucepan again and add equal quantities of water and sugar, I used 1 litre of water to 1 kg of sugar. Bring the sugar solution to the boil and allow the sugar to dissolve. Now gently add the peel and simmer for about an hour to allow the peel to soften and go slightly translucent. Turn off the heat and allow the peel to cool in the syrup for a while. Once the syrup is cooler, gently lift out the peel strands and lay onto a rack so they can drip dry a little. Turn on the oven to a low temperature and place the peel in the oven on the rack for about an hour just to dry out some more. After an hour remove from the oven and your candied peel is ready to use. Store in a air tight container until you are ready to use it in a delicious recipe.